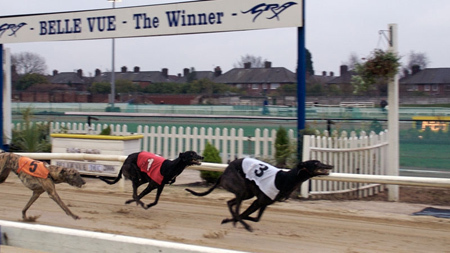 Experience the thrill of greyhound racing at Manchester's popular Belle Vue stadium. Usual Price: £25. Price on the night: £15. As soon as the doors open, the electric atmosphere is unleashed even before the racing begins, the buzz of the stadium is infectious wherever you choose to catch the race action. The stadium has a luxurious glass fronted grandstand and a four hundred seat restaurant, six licensed bars including a sports bar incorporating 21 televisions and two large screen projectors.